Well it was a pretty active week and weekend since our last report as a lot of fish rolled in! On Saturday, the Bell Buoy looked like the August long weekend with at least 40 boats. The herring were in the area and the chinook piled in as well. It was some of the best early season fishing any of us have ever seen. By best I mean that some limits were taken on the morning of Friday and Saturday on 5 hour charters. That is good fishing anytime of the year but for March that is red hot. 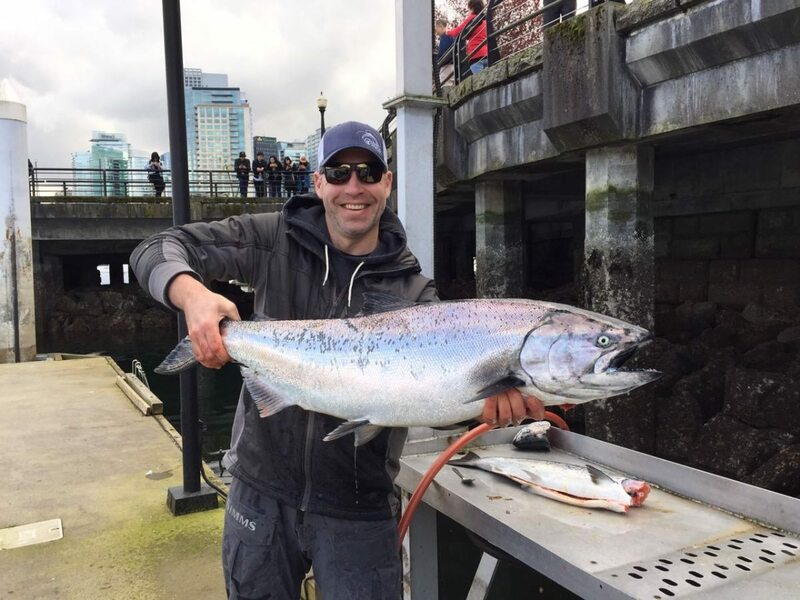 Things slowed down considerably on Sunday as expected as the fishing was hot there on Thursday, Friday, and Saturday. A lot of fish ended up on the BBQ and the fish that were around still were likely a little shell shocked or sore lipped. 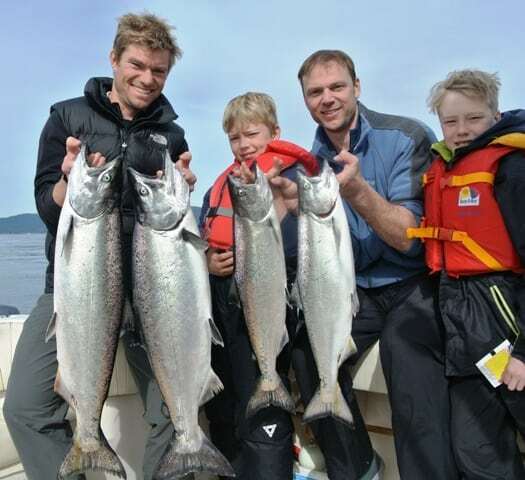 Eddie’s guests with 4 nice chinook from the Bell Buoy on Friday. So there are definitely some good sized schools of chinook around, cruising our harbour and Howe Sound looking for herring. This is a really good sign for the Hump, and this fishery is only 2-3 weeks away. There weren’t a lot of boats up Howe Sound this week because the fishing was so hot off the Bell Buoy. There were a lot of small fish taken by those who decided to fish Howe Sound and a few keepers, but you really had to work through all the small guys. My hot spoon on the weekend was a 3.5 Pesca Gut Bomb and bait was also producing very well. My hot flasher was the Salty Dawg (named after our 27 foot Grady White guide boat, the Salty Dawg). This is a flasher that we worked on designing with Ok’i Tackle this past spring and summer. We fished the prototypes last year on the Hump, Thrasher, T-10, Sandheads and up Howe Sound for winters. This is a deadly flasher and we did very, very well with this flasher last summer. It is now a staple in our arsenal and we are happy to share it with you. It starts with a glow chartreuse blade. From there we added kinetic tape to one side and an extra center strip of glow tape to the other side. You should see this flasher light up in the water with the kinetic tape and glow blade! 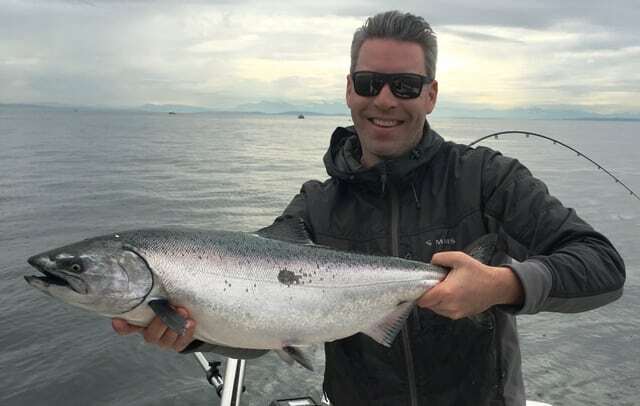 The first time we saw it in the water we knew it would be deadly for chinook. 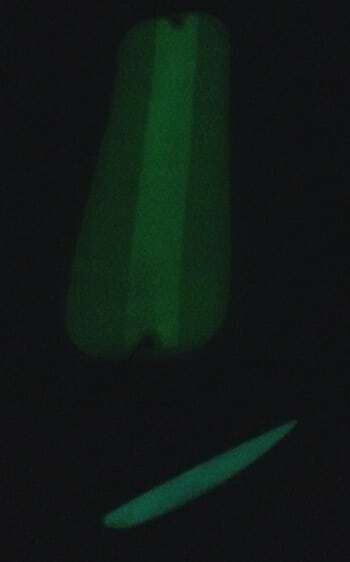 That fact that the blade glows and there is an extra center strip of glow tape on one side also makes this flasher at home when fishing down deep or when fishing in dirty water. If I have this flasher on the boat and my other favorite, the Greeen Onion Glow, I know I am set for chinook salmon in our local waters from up shallow all the way down to 200 feet. We also have been working on some spoons with Ok’i so stay tuned for more info on those in future reports. We have stock on the Salty Dawg flasher and the new spoons, so if you want to come down to the shop to take a look, we have what you need! Jason with a fat chinook taken from the Bell on Saturday. 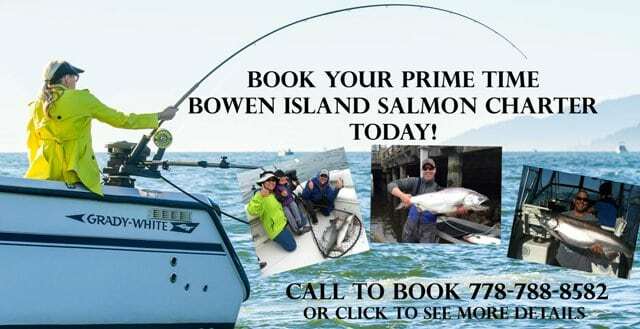 If you want to book a trip for chinook, now is the time as the Hump will get good very soon. Don’t wait for the report, book in advance so you can request the best dates and tides. Call Jason at 778-788-8582 to book your trip.